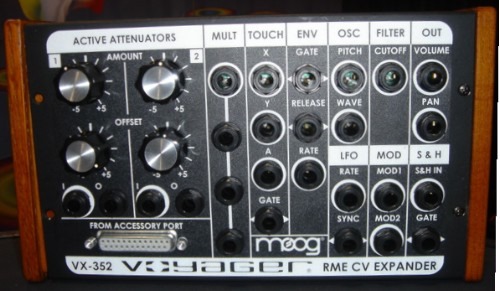 NAMM: Moog Voyager RME does CV; What’s Next from Moog? The rumored polyphonic and low-cost Moog synths were no-shows at NAMM but that didn’t mean there wasn’t anything to get excited about in the Moog booth. Owners of the Voyager Rack Mount edition are about to get their wish for more expansion capability in the form of the VX-352 CV input expander. The VX-352 turns the synth into a full-fledged mini-modular system by allowing it to easily accommodate external CV gear. While announced previously, NAMM was the first time anyone outside of Moog has seen one in person and we’ve got one of the first pictures. For other new Moog products, Moog says you’ll have to wait until the next Musikmesse, to be held in Frankfurt, Germany in March. Everyone get that? We’ll be watching closely for Moog news from Germany. Photo by Lee Sherman.